12 Şubat 2019 Salı 00:03 - 2 reads. The former self-proclaimed Caliphate of the Islamic state (IS) has shrunk to a village in the East of Syria. In Baghus IS to keep fighters in an approximately four square kilometer large territory that stretches up to the border with Iraq. The Kurdish news Agency Hawar reported on Monday morning of fierce Fighting around Baghus. 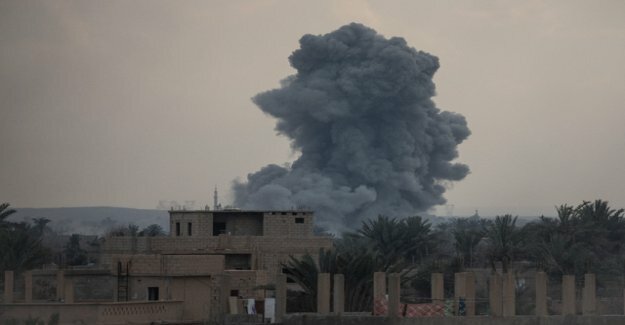 the US-Arab Alliance, known as the Syrian democratic forces (SDF) supported Kurdish, has announced on Saturday the start of the decisive battle against the IS. Finally, the slowed advance of the SDF, because the IS needs of the civilians as a human shield. The Anti-IS fighters encounter in addition to areas with land mines, suicide bombings, and sniper attacks. The SDF, led by the Kurdish militia YPG. people who have escaped from the last IS area, reported that in Baghus "between 500 and 600 terrorists" to stop. SDF spokesman, Mustafa Bali, confirmed the information. IS-chief Abu Bakr al-Baghdadi was but probably not in the area. "We do not believe that he is in Syria," said Bali, the AFP news Agency. the French Alliance troops have positioned themselves on the Iraqi side of the border, in order to possibly fleeing IS fighters to intercept. The IS fighters are practically boxed in. The Kurdish-Arab ground troops supported by U.S. air attacks. It is only a matter of time until the remaining piece of the Caliphate. The American President Donald Trump is expecting a re-conquest of the last IS-of the region in the next few days. The so-called decisive battle against the IS is in progress: Baghus is located in the East of Syria on the border with Iraq. With the loss of its territory the IS is weakened, but not destroyed, said the French Journalist Nicolas Hénin in an Interview with the "Tribune de Genève": "You must not cry out to fast victory." By the IS will continue to present a danger. Hénin is a connoisseur of the Middle East. For many years he spent as a reporter in Iraq and in Syria, where he the rise of the IS up close and was able to follow. In June 2013, he became a prisoner of the IS. Ten months later, the 43-year-old Frenchman came free again. After Syria, he's not returned. Hénin reported that many of the jihadis are on the run or in the desert would have to organize themselves. In the former Caliphate areas, there were again uprisings. These areas would be poorly governed, the people there were very unhappy. This is a breeding ground for rebellions, which could be transported fighters of IS. Sleeper cells of the IS could be more active. In Addition, Hénin indicates the terrorist threat in Europe. A part of the foreign fighters had returned. "The fact that her Ideal was destroyed, the project of a Caliphate, is likely to have awakened in IS-people the desire for revenge." Hénin recalled that only last autumn a big stop in Rotterdam thwarted. A victory over the IS not could be long. In Syria, IS could rise again once the U.S. withdrew troops, which had announced a US President, Trump last December. So much criticism was a member of the Trump, even from within its own ranks. A week ago, the Pentagon published a report that warns of a withdrawal of the United States. Within six to twelve months, the IS could grow in strength. According to the media, the withdrawal of some 2000 US soldiers is to be completed reports from Syria by the end of April. This is likely to change the balance of forces in the Region. Turkey is threatening with an Offensive in Northern Syria against the Kurdish militia YPG. Ankara looks to be an offshoot of the banned as a terrorist organization classified Kurdish workers ' party PKK. At the same time, the YPG is the main Syrian ally in the international Anti-IS coalition.